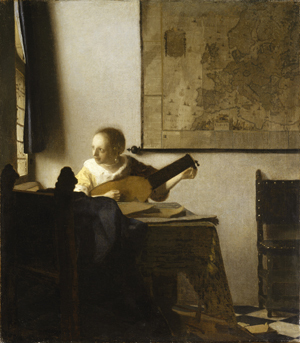 Johannes Vermeer’s “Woman With a Lute” is in Pasadena at The Norton Simon Museum through September 26. The painting is on loan from The Metropolitan Museum of Art in New York. When it is returned to The Met, there will not be a Vermeer on the West Coast—none of our museums own one. This fact is more a result of Vermeer’s production than the quality of collections in the West; only 36 works have been attributed to him. An excellent 15-minute Norton Simon Museum Podcast has been produced featuring Chief Curator Carol Togneri’s interview of the Met’s Curator of European Paintings, Walter Liedtke: http://www.nortonsimon.org/podcasts. The Norton Simon Museum is a worthy temporary home for this gem. If you live in Southern California or you are traveling in the area, a stop at this beautiful, compact museum is well worth your time. The collection is broad and includes outstanding holdings of Early Renaissance, High Renaissance, 17th and 18th Century European, Asian, Impressionism, Modern, Contemporary, prints and photographs. Hopefully, you’ll have some time to relax and have lunch in the charming sculpture garden. Although you may have never been there, you have certainly seen “Norton Simon Museum” on the building in the background of Rose Parade telecasts. ~ by Thomas on August 6, 2011.
the link posted for the podcast is not active. please advise how one might hear it. thanks. The link has been fixed. Thanks for reading, Jo!